When submitting your offer on a house, and in particular when there are competing offers in our sellers market, you want your offer to look its best. Think of it as dressing your offer for success. Rather than dressing like a slob! 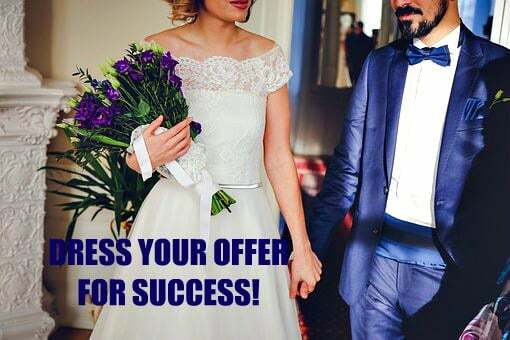 WHY DRESS YOUR OFFER FOR SUCCESS? Well number 1, to make a good impression, and to compete effectively against any other offers. Offers that are sloppy, incomplete, or have mistakes will convey a bad impression to the listing agent and seller – not a situation you want to be in as a buyer competing for a house you really want! Appearances make a big difference, and you want your offer to look its best, rather than have the other agent and/or seller have concerns about working with you and your agent. WHO SHOULD DRESS THE OFFER? Good question…and it’s a shared responsibility between buyer and buyer agent (or me, if we work together!). Certain key decisions about price, closing date, terms and conditions, appliances, and time frames for inspections. If those decisions are not favorable, based on competition and current local market conditions, the offer will not look good! Putting together a well-dressed offer is then my role – complete, no errors, appropriate signatures and dates, and so forth. If the details of an offer are not competitive there is nothing that’s going to make your offer more appealing to the seller, no matter how well-presented the offer may be. At the same time putting a great offer forward in a sloppy manner won’t make a good impression, and might lead to concerns by the listing agent and seller there could be trouble ahead with carelessness or other issues. First impressions make a big difference, and that’s true for buyer offers, too! The basics of a well-dressed offer are simple, beginning with complete paperwork. That’s MY job! Your offer should be dressed well in other ways, too. While you want to make a strong offer in any situation if you want success, in the case of competition you probably want to make the best possible offer based on list price (but of course we’ll discuss a strategy). There might not be a second chance when there are multiple offers. Terms and conditions should be clean and clearly laid out – keep in mind that asking for too much may not be competitive. There are a number of things I do for my buyer clients to help ensure the listing agent and seller receive a well-dressed offer, and a favorable impression. A lot of that has to do with establishing a positive relationship and good communication, along with follow-up, following the listing agent/seller instructions (not everyone does, for some reason), and more, depending on the property and the buyer’s situation (e.g., cash versus loan). Want to know more? Why not give me a call at (760) 840-1360 so we can discuss your personal housing needs, lifestyle and budget? Then we can create a strategy to help you buy a new home in Carlsbad or nearby, with a well-dressed offer!